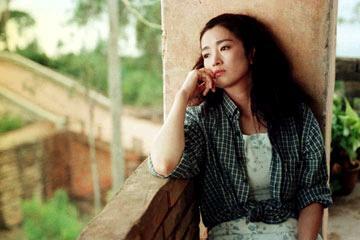 In the early to mid 90s, Chinese actress Gong Li impressed the world with her beauty and acting ability. Then she disappeared off the face of the earth. She has popped up occasionally, typically not in a role but on some film jury in Europe. The reason for her period away from film was the break-up of her relationship with "director Zhang Yimou, one of the members of the so-called "fifth generation" of Chinese directors. Together, they made such acclaimed films as Shanghai Triad, Raise the Red Lantern, and To Live. Then, their relationship soured, and Li appeared less frequently in less admired films (The Emperor and the Assassin, Breaking the Silence). Zhou Yu's Train marks her official return to cinema, and unfortunately for Li, it's a little too pretentious and artsy to do itself any good. Zhou Yu's Train looks fantastic, and director Sun Zhou (Breaking the Silence, The True-Hearted) seems to love Li, as the camera frequently lingers on her, but everything else slowly turns into cinematic mush. Li is Zhou Yu, a lady who paints beautiful patterns on porcelain finery. When she meets poet Chen Ching (Tony Leung Ka Fai, Double Vision, The Treatment), they fall in love and begin a whirlwind romance. However, Chen lives far away, and in order to meet, Zhou must take the long train ride to his town. Her love and beauty inspire him so much that he writes a book of poems entitled "Zhou Yu's Train," and the two seek a way to publish his work. At the same time, the script, by Sun, Be Cun, and Zhang Mei moves forward in time to relate the story of Zhou and meets Zhang Jiang (Sun Honglei, The Road Home), a veterinarian initially interested in buying some of her wares. Zhang is obviously infatuated with Zhou, who is reluctant to being a relationship with him because of her love for Chen. So what happened between Chen and Zhou? By the time Sun reveals it, it really doesn't matter since anybody paying attention stopped caring. It's not that the two stories taking place are confusing. Heck, there's another strand with Li with a clipped haircut. The romance between Chen and Zhou never goes too far, because Chen refuses to commit to a relationship. Zhou offers to sell old family heirlooms to finance the publishing of his poems, but he's too wishy-washy to make a decision. This makes Zhou's devotion to him after she meets Zhang all the more confusing. It seems that Sun gets around to start revealing what exactly is going on, things have become too contrived. He retreats from any sense of reality and prefers a more metaphorical story. What exactly does Chen represent in Zhou's life? It doesn't add anything to the plot, and instead the viewer feels tricked. This is not coming off as deep and emotional, it is just a plot device to make Sun look like a clever director. And as annoying as the story is, one cannot deny his eye for all things visual. The camera loves Li, and Sun films her in close up, slow motion, and any other way he can to accentuate her beauty. Still, there are only so many times one can watch Li running in slow motion, or looking forlornly at something in the distance before it becomes old.